A boarding team from HTMS Similan investigates a skiff suspected of being involved in an attempted pirate attack on MV Hellespont Protector on the morning of Oct. 28, 2010. The Hellespont Protector evaded the skiff by increasing its speed, in accordance with counter-piracy Best Management Practices. On the morning of Oct. 28, 2010, the tanker MV Hellespont Protector was attacked by a suspected pirate skiff in the Gulf of Aden. The Liberian-flagged merchant vessel was transiting the Internationally Recommended Transit Corridor (IRTC) when it was attacked by suspected pirates, who fired at the vessel with AK47 assault rifles. Due to the large naval coalition presence within the region, HTMS Similan, from the Royal Thai Navy, was nearby to assist. The Fusu-class replenishment ship, currently supporting Combined Task Force 151, immediately launched its helicopter to investigate the skiff. With the MV Hellespont Protector increasing its speed, the suspected pirates were unable to catch the merchant vessel and aborted their attack, dropping their weapons into the water in an attempt to escape. Within minutes, HTMS Similan’s boarding team apprehended the skiff. 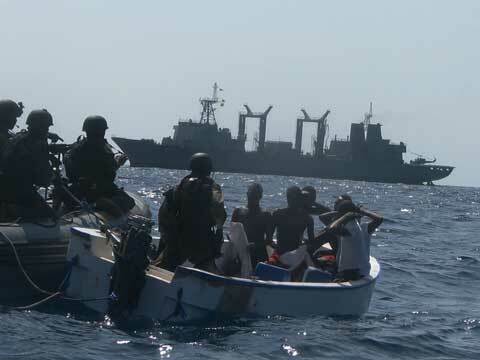 After taking records, the skiff was forced back to the Somali coast, and a warning of suspected pirate activity was issued to fishing boats and commercial ships in the region. CTF-151 was established in January 2009 as a multi-national counter-piracy task force. In conjunction with NATO and EU Naval Force (EUNAVFOR), ships from CTF-151 patrol in the Somali Basin and the IRTC in the Gulf of Aden. CTF-151 also supports the Best Management Practice methods which are promoted to the shipping industry for the avoidance of piracy.